The Port of Corpus Christi Commission approved Thursday (Mar28) a long-term (50-year) lease agreement with Lone Star Ports, LLC (Lone Star Ports), a joint venture between the Carlyle Group and the Berry Group, for approximately 200 acres on Harbor Island to develop a state-of-the-art petroleum export terminal. Featuring the latest in safety, security and environmental technologies, the facility will connect U.S. crude producers with all major international markets. The lease agreement between the Port of Corpus Christi Authority and Lone Star Ports will provide significant accretive value in the Port’s annual operating revenues, and the project is expected to create more high-wage jobs and more economic prosperity for Port Aransas, Nueces County, and throughout Texas. Lone Star Ports’ facility on Harbor Island is designed to be the deepest-draft safe harbor crude export facility in the nation when commissioned. Immediately upon completion, the facility’s two docks will have access to the improved 56’ ship channel depth, making it the United States’ first and only onshore terminal capable of fully loading Suezmax vessels and nearly full loading Very Large Crude Carriers (VLCCs). Civil works for this facility repurposing project have been underway for the past year ahead of finalizing a definitive lease agreement, including the demolition of existing dock structures from a previous decades old Exxon crude import terminal on Harbor Island. The execution of this new lease enables the parties to commence major equipment and materials procurements and other construction efforts. “This project on Harbor Island is the next pivotal step in directing the growing crude oil production in the United States to global markets via our Port of Corpus Christi,” said Charles W. Zahn, Jr., Port of Corpus Christi Commission Chairman. 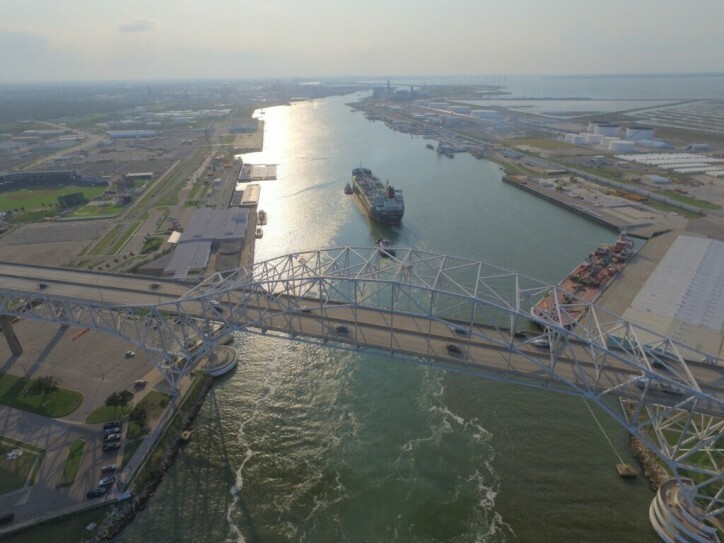 “The Berry Group looks forward to working with the Port of Corpus Christi and our partners at The Carlyle Group to continue to bring jobs and prosperity to Corpus Christi and the Gulf Coast community as we have for the last 65 years,” said Marty Berry, of The Berry Group.